Pearl Jam's Eddie Vedder always loves to rep his favorite team the Chicago Cubs and in a new MLB spot, Vedder joins players Anthony Rizzo and Kris Bryant to create a jingle for their Bryzzo souvenir company. The funny spot, which is the second installment of the Bryzzo story, centers on the players setting up a souvenir company based on all the home runs they hit last year. 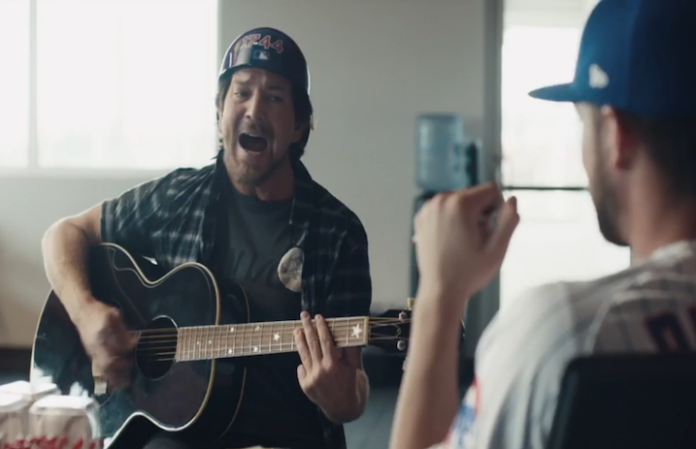 Vedder is called in to create a jingle—and we have to say, his jingle career is looking bright.